The global market outlook is far less rosy than the so-called experts would have you believe. Global stocks have set record highs, yet sentiment readings have hit off-the-charts extremes. Gold, silver and bonds are in multi-year bear markets. Investors in major markets around the world are exposing their money to unprecedented (and mostly unknown) risks. Regional economies recently said to be "recovering" are slipping back into recession. And despite widespread excitement for stocks, Main Street is still struggling. You will not get this reasonable and objective outlook on the global markets from any other source. 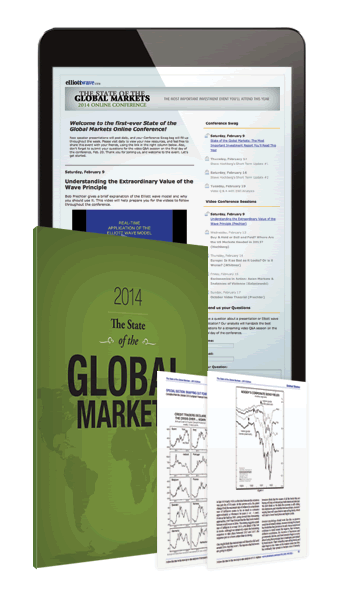 EWI's new report, The State of the Global Markets -- 2014 Edition, is a one-of-a-kind resource. I guarantee that you will read nothing like it anywhere. EWI subscribers pay more than $500 annually for this level of analysis – and they consider it a bargain. But for a limited time, you can get this exclusive Club EWI report 100% FREE. Tell you what's really going on in the global marketplace. Reveal dangerous market pitfalls no one else sees coming. Uncover once-in-a-lifetime investment opportunities that could serve you well beyond 2014. Get The State of the Global Markets Report -- 2014 Edition now (for FREE), and enjoy dozens of independent global market insights that will prepare you to survive and prosper in 2014 and beyond. IMPORTANT: Please do not buy or sell a single share of stock -- anywhere in the world -- without reading this report first. Belief in perpetual inflation has been a major reference point for optimistic feelings about the stock market. With the Fed’s announcement in September that it will delay plans for “tapering” its breakneck pace of inflating, and with the appointment of “dove” (i.e. Inflationists) Janet Yellen as Chairman of the Federal Reserve, investors’ certainty about coming inflation must be higher than at any time since 1980. That’s when gold and silver reversed from all-time highs and began a two-decade bear market. That experience shows how much damage society-wide investors’ certainty about ever-higher inflation can wreak. It may seem like folly to think this way now. Of course it does; that’s just how it felt in 2000 and 2007. It also felt like folly to turn bullish in March 2009. That’s how people feel at extremes of this degree. P.S. This report is available to you for free for a limited time, exclusively from EWI. Please get access to it now while its valuable year-in-preview advice can help your portfolio in the New Year. Get the free report now.